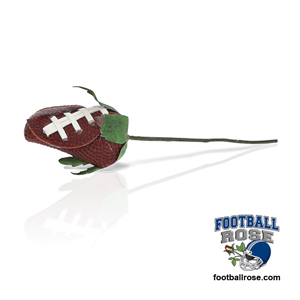 The Football Rose Corsage Stem is an alternate version of the Football Rose that can be used in corsage and boutonniere arrangements. It is the same football rosebud featured on our long stem roses, but it is mounted on a short (4"), thin, flexible wire stem. 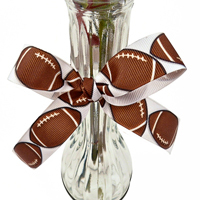 The smaller stem allows you to incorporate the football rosebud into customized arrangement ideas where the traditional stem is not needed. 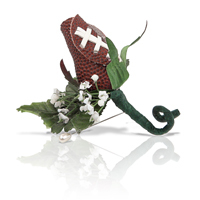 Bring the Football Rose Corsage Stem into your local florist and request them to customize your boutonnieres and corsages for your special event. From Tammy Z of Bonduel, Wisconsin on 10/15/2015 . They look really nice. Can't wait to see what the florist will do with them!!! From michelle shea of richmond, Virginia on 3/6/2015 . Can't wait to give my wedding party these for my wedding in October!!! They are awesome!!!! From Anonymous of Belton, Texas on 10/14/2014 . From Amanda Dailey of Clay, New York on 4/1/2013 . I found these roses through another website. I fell in love with them the second I saw them. . . .
From Amy Seewald of Fruitport, Michigan on 12/2/2012 . 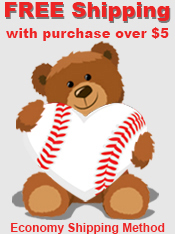 I ordered these for my sports themed wedding, and am more overjoyed than I could imagine I . . .